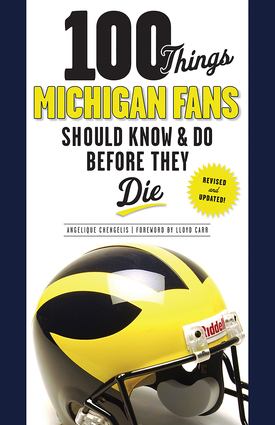 Angelique Chengelis is a sportswriter for the Detroit News. Michigan football has been her primary beat since 1992, but she has covered countless sporting events including Super Bowls, U.S. Opens, PGA Championships, Ryder Cups, Stanley Cup Finals, NBA Finals, Indianapolis 500, Daytona 500, and NCAA men's and women's basketball tournaments. She is a contributor to ESPN's NASCAR coverage as part of the NASCAR Now show. She lives in Detroit, Michigan. Lloyd Carr is a College Football Hall of Fame coach who led the University of Michigan Wolverines to five Big Ten Conference titles and a National Championship win. He served as head football coach for 12 years and is a retired assistant athletic director. He lives in Ann Arbor, Michigan.